I stand by my optimism. Every hope was justified. We’d seen Auburn baseball’s starting rotation look like a two-headed nightmare monster, poison dripping from its bared fangs, with a smaller-but-still-intimidating third head hiding behind the first two. We’d seen their bats rip a pair of top-20 teams for 53 runs in two series. We’d seen them sweep the current No. 5 team in the country. We’d seen them play seven SEC series — five of them top-25 clubs — and lose just one. We’d seen Butch Thompson provide what seemed like the steadiest hand on the Auburn till we’d seen in ages. So I decree we are forgiven for not seeing this coming. I doubt anyone, anywhere expected Auburn’s starting pitchers to post a 6.00 ERA in over a seven-game span in which Keegan Thompson and Casey Mize accounted for four starts. I’m not sure anyone expected the bats that had run so hot against Arkansas and Mississippi State to simultaneously score six runs in four games. But as for how Auburn fans should deal with this … that I’m less sure about. The good news: from my admittedly limited online perspective, the number of us reacting with lizard-brained out-and-out rage is perhaps fewer than during men’s basketball’s late-season swoon, which might be an indication that we’re more sympathetic of the difficulties in raising a baseball program from the ashes … or maybe just that the hurdles we expect Bruce Pearl to clear in Year 3 are higher than those for Thompson in Year 2. It could also simply be that fewer of us are paying attention during baseball season. But ultimately the question is the same regarding Thompson’s squad as it was regarding Pearl’s: How disappointed are we allowed to be when a team fails to meet expectations created by its own success? As it stands, the Tigers remain well on track to qualify for a top-10 spot in Hoover and make a regional. When the season began, that would have been enough for this to be a highly successful season, right? If the Tigers slip from their highest peaks — No. 4 in the country! — and still stop rolling at a point higher up the mountain than we thought they could climb, is it fair to gripe? The answer probably lies in how far that slide extends. If the basketball Tigers had fallen short of the NCAA bid they ever-so-briefly-almost-flirted with and settled for one of the final slots in the NIT, no one would’ve batted an eye in the end. That the season ended with a loss to rotten Missouri and no real hope of an invite to even the three-letter tournament, however, resulted in the batting of many, many eyes. 3 games left at Plainsman Park that will determine the season. Hate that it comes down to that but here we are. It’s 100 percent fair to hate that; if anybody would be the judge of that, it’s Kevin. But there’s a flip side to this coin, too: when was the last time Auburn had this much season to determine? 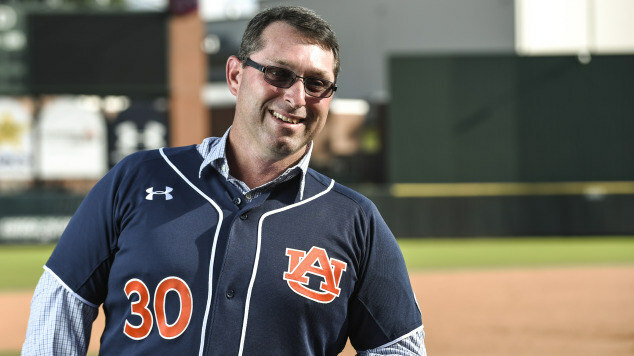 Yes, Sunny Golloway got Auburn to a regional in 2015, but that team’s ceiling rarely felt anything like this team’s ceiling — meaning the stakes for this weekend, I would guess, are higher than they’ve been for any series on the Plains in quite a while. 27 innings to save the season isn’t what we wanted, but compared to some alternatives where there’s no season worth saving, it’s an accomplishment worth noticing — even celebrating. As we learned the hard way in late February and March, it’s a difficult thing to go from playing low-stakes games to creating high-stakes games to winning those games in the space of one or two seasons. Further failure against the Rebels and a pratfall in Hoover won’t feel good, to say the least, just as the current streak has felt like 10 consecutive days of being punched in the gut. But that feeling is the price of moving forward to the place where these programs can make us feel gut-punches at all. This is what progress is like. It should hurt, but we shouldn’t let it hurt too much. Meanwhile, on a diamond of a different dimensions, Auburn softball is the No. 7 national seed and should have the pleasure of getting reacquainted with their old pal Paige Parker in the Super Regionals, this time with the benefit of facing her and the Sooners at Jane B. Moore. On the one hand, it’s a lower seed and more difficult path back to OKC than we’d have hoped for at the start of the season. On the other, between Kasey Cooper never quite looking like Kasey Cooper (she even lost her perfect GPA, watching it fall all the way to a 3.98! ), a handful of major off-field distractions, and Makayla Martin’s struggles in SEC play, that Clint Myers has built his program a foundation strong enough to still earn home field for Supers is no less amazeballs than ever. Been said before, worth saying again: imagine telling an Auburn fan in 2012 that finishing runner-up in the SEC and earning the No. 7 seed fell below preseason expectations for the Tigers’ softball team. The mind reels. But mindblowing as Myers’ work has been, it’s going to hurt and hurt badly if Cooper’s and Haley Fagan’s careers end anywhere other than the WCWS. Unfortunately, there’s reason for concern they won’t, even aside from Parker being Parker. Losing an SEC Tournament game to LSU isn’t cause for alarm in and of itself — the purple Tigers are a solid squad, and three straight SEC tourney titles was always a big ask — but the loss seemed to confirm that postseason play might not magically solve the problems that have dogged Myers and Co. the past several weeks. Cooper went 0-for-3 with three strikeouts, two of them with a runner on base. The defense that gave away what would have been a massive series win at Florida committed a season-high five errors. The bottom four slots in the lineup went a combined 0-for-10 as Auburn mustered just five total hits and no runs. And most intriguingly, Myers didn’t trust Martin with the start, handing the ball to Kaylee Carlson for a second straight game. That’s a notable break from Myers’ policy in previous postseasons, in which starting duties rotated — and potentially a sign he’s not currently comfortable with Martin getting the call in games of a Regional or Super’s magnitude (or not. See update below–ed.). Carlson handled the situation with relative aplomb, allowing just one earned run in her four-plus innings (albeit while giving up seven hits and a walk), while Martin looked excellent coming out of the bullpen. And riding a single starting pitcher for long, long strings of postseason innings obviously isn’t unheard of in softball — just ask our new SEC Tournament champions at Ole Miss, or the aforementioned Ms. Parker. But based on his previous postseason decisions, if Myers does decide to ride Carlson as far as she can go, it’ll look like a choice he’s been backed into — and given the offense’s woes, one that will place a staggering burden on Carlson’s shoulders. She would be up for it. Whether the rest of the team will be will ultimately determine whether we remember this Auburn softball season as another solid entry in Myers’ magnificent run or something much more special. UPDATE: As pointed out by a reader on Twitter, the Friday rainout and scheduled Saturday semifinal/final doubleheader — which I will admit to having forgotten about in the haze of a weekend toggled relentlessly between sports-watching and my daughters’ four different dance recitals — likely determined Myers’ rotation decision more than any doubt regarding Martin. With Carlson having a day of rest and both pitchers needed to throw Saturday anyway, it makes sense that Myers would throw Carlson against LSU and save Martin for an Ole Miss team that didn’t appear to be quite as big a threat as the Tigers. I wouldn’t yet rule out Myers going the all-Carlson-all-the-time route in the Supers if Martin struggles in the Regional, but the schedule change means Myers hasn’t actually yet broken with his prior postseason rotation policies, and it’s erroneous to have suggested otherwise. Apologies. Sidenote: My inclination is to complain about the Sooners being underseeded, but given the cataclysmic incompetence shown by the selection committee when it comes to Minnesota and Alabama — as horrific as the Gophers’ treatment is, consider that the Tide finished ahead of Kentucky in RPI, SEC standings and overall record, and were still seeded three spots behind the Wildcats with the nation’s No. 1 and No. 2 teams between them and OKC — I should probably just be happy Auburn’s playing the Supers at home at all. …..I’m still enthralled with both stick-ball coaches. Players are fallible, injuries happen, and you don’t win ’em all, especially in baseball/softball. The best team in major league baseball in the regular season as of today is the Houston Astros, who’ve lost nearly 30 percent of their games.